‘I often find myself regretting the fact that I spent a good percentage of my early school days longing for the weekend, dreaming of organs, impersonating the teachers, but not really engaged in the act of learning too much. (Nowadays, as a teacher, there are many who would say that nothing has changed!). But one of my main regrets is that I failed to pick up any traces of a useful foreign language. My ability to speak French is pretty much limited to facts about my name, address, colour of my eyes, what day it is, the weather, (as long as it’s raining), and asking the way to a launderette. So during Choir tours abroad, my linguistic shortcomings have come back to haunt, amuse…and embarass me in equal measure. As a teenager, I spent too much time reading about the fine organs on the continent, and would pore over organ photographs and specifications with exotic stop names like ‘Clarin Sordino’, ‘Hautbois d’Amore’, ‘Bauerpfeife’ – names that if you saw them on a menu would have you salivating at the very sound – perhaps not so with ‘Grobemixtur Unterchormass’! But when the opportunity to play on some of these fine instruments arises, no amount of listening in Miss Alain’s French lessons, or learning all the stop-names off by heart could prepare me for the reality of THE FOREIGN ORGAN! 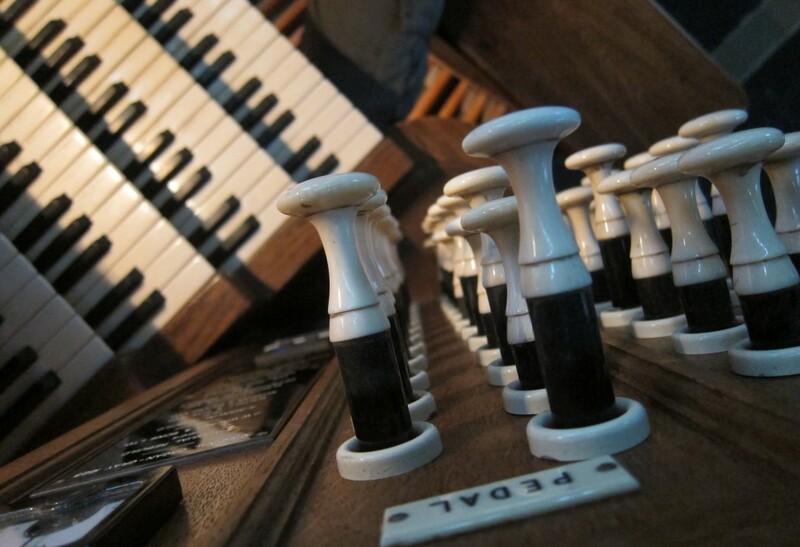 I know that most organists would never dream of putting on a concert or recital without meticulous planning, rehearsing and getting to know the organ beforehand, but often, on a tour, this is not possible. Take for example, my visit to La Cathédrale Notre-Dame de Saint-Omer, where due to my appalling pigeon-french, I spent a good half-hour standing underneath this colossal organ, unable to gain access, next to a locked door with a local gentleman who unbeknown to me had the very key in his pocket! We stood side-by-side in blissful Anglo-French ignorance of the fact that he was waiting for me and I was waiting for him. Eventually, thanks to a kindly interpretor, the door was unlocked and up the stairs I ran to encounter an immense instrument of sheer beauty and power, the craftsmanship of Aristide Cavaillé-Coll himself – but no visible sign of a blower switch ANYWHERE. My page-turner started to look very pale and we both searched frantically, as down below in the cathedral, the audience started to take their places. We traced any visible electric cables back to their source and finally found the antique and, rusty hidden switch.We gave it a nervous bodge and fired up the big beast, just as the audience applauded the choir processing in to begin the concert! The organ console was immense, very beautiful, comfortable to play, but full of things I’d read about and never tried out. Good fortune ( or great programming?! ), meant the first couple of concert items were ‘a capella’ (unaccompanied), so I could ‘toot’ a chord or two on a ‘montre’ and as the choir enjoyed the acoustics below, I took a look at the ‘aids’ to registration, and then wished I hadn’t! Well, the concert went very well, and by the end I had fallen in love with an inaminate object. I was playing a historical instrument, unspoilt by progress, but an instrument that really had ‘soul’ and every note was a real joy! …and then there was, MALAGA! This was ground-breaking, in terms of a learning-curve that was pretty near vertical! Malaga Cathedral does not have an organ – oh no, it has TWO! And not just a big one and a little one – but TWO IDENTICAL ORGANS! Two identical organs (one ‘Gospel’ and one ‘Epistle’), with Trumpets ‘en chamade’ all around. I have never seen so many! I was helped on this occasion, as the cathedral organist was there to speak a Spanish welcome to me. I responded with suitably English appreciation. The language barrier was broken down by our superb translator, without whom I would have run away! The stops were, as expected, pretty unreachable from the sitting position, so you needed an assistant to ‘pull out & push in’, and ideally they should be Spanish organists. With a baffling array of stops such as ‘Cornettas, Clarinos, Flautaudos’ and ‘Trompetas’ above us, to the left and right of us and even behind us, and a choir situated what seemed like a hundred miles away, this was going to be one-heck-of-a-gig! However, I had my fiancee, (now thankfully Mrs stmarysorganist), on one side of the console and the Cathedral organist on the other. In a show of Anglo-Hispanic unity that would impress the EU, we managed to get our way through music which was not designed for instruments such as these! So, Miss Alain, you were right – I should have listened in your french classes, and maybe, just maybe, one frenchman would not have wasted half-an-hour of his life waiting to meet an organist who was standing right next to him! What a wonderful story Sir – I totally enjoyed your poetic writing and I MUST AGREE that picture under the St. Omer Organ shows its beauty and size – 1@@k closely TWELVE PILLARS wow to hold it up truly awesome. Sometimes I could cry just looking at the sheer beauty of these skillfully built sculptures – indeed works of art – mmuahhh x gorgeous. I was suprised that it has the stops layout as in the UK and not Cavall Coll style spreading outwords from the manuals like St. Sulpice – another drop dead gorgeous beast. Stopknobs in Barcelona Cath are in Catalan – but they do all work. And beware the unsuspected short octave on historic instruments! Thank you so much for sharing your experience. Your blog is simply hilarious! And welcome to the organ of Babel. The organs in Malaga look really interesting what a happy experience! It was the “superb” translator who wanted to run away! I must have been away the week they did 18th Century organ vocabulary in my O level Spanish class. but as ever you rose to the occasion and it sounded wonderful. Happy memories of so many madcap trips. I am specially looking forward to your description of the Cypriot convent when the autorythm broke through on the sad little keyboard!